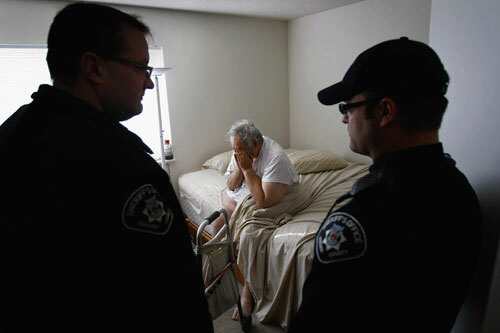 Sheriff's deputies wake Harvey Lesser, 58, after entering his apartment to evict him on December 11, 2009 in Boulder, Colorado. Lesser, an unemployed software developer suffering from high blood pressure, diabetes and chronic back problems, said that could not afford to make his rent payment the previous month, leading to the eviction. Since being laid-off by IBM, he said he had exhausted all of his savings, including retirement funds, for cost of living expenses well as the $700 monthly payments for personal health insurance.